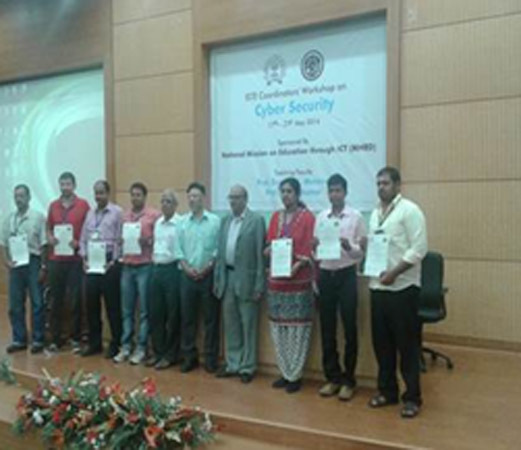 Indian Institute of Technology Bombay organized a five days ISTE WORKSHOP on Cyber Security under the National Mission on Education through ICT (NMEICT). 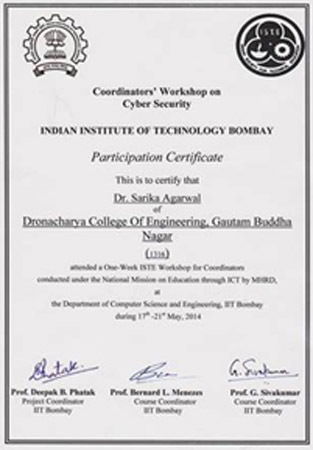 The objective of the workshop was to equip the faculty of engineering colleges with the knowledge of various topics on Cyber Security such as Cryptography, Network Security, Web Security and SQL Injection so that they can conduct the workshop at their Remote Centres which is scheduled during 10th- 20th July, 2014. Faculty from across the nation attended the workshop. Dr. Sarika Agarwal, Assistant Professor, Department of Computer Science & Engineering from Dronacharya Group of Institutions, Greater Noida was nominated to attend the workshop as a Workshop Coordinator. The workshop was inaugurated with a key note address by Prof. Deepak B. Phatak, Project Coordinator and by Prof. G. Siva Kumar, Course Coordinator, IIT Bombay on 17th May, 2014. They emphasized on the role of awareness in prevention of cybercrime during their address. Prof. Bernard L. Menezes, Course Coordinator, IIT Bombay, explained the basics of cryptography and different algorithms based on it in the first technical session. All the participants carried out hands on experiments using Wireshark (Network Analyzer) tool to gain an in depth understanding of the concepts delivered. On 18th May’2014, the first session was based on “Security Protocols and Software Security”. The resource person of the session was Prof. Bernard L. Menezes. The session was followed by a practical activity on SQL Injection attack. Prof. G. Siva Kumar, Project Coordinator, IIT Bombay, provided an insight on “Securing the IT Infrastructure” to the participants in the first session on 19th May’2014. The session was followed by a lecture on “Malware, Network security and Intrusion Detection” delivered by Prof. Bernard L. Menezes. On 20th May’2014 in the pre-lunch session, a practical hands session on Network and System Forensics using Wireshark and OSSEC was covered by all the participants. During post lunch session, the participants practiced “Penetration Testing” using XSS attacks. The workshop concluded on 21st May’2014 with sessions on “Cryptography-II” delivered by Prof. Benard L. Menezes, in which he discussed the various research areas on Cryptography. The session came to an end with a series of questions from the participants which were wisely answered by the expert speaker. During valedictory session, Prof. Deepak B. Phatak, Project Coordinator, IIT Bombay congratulated the participants and his team members for their successful conduction of the workshop. He also sought feedback for the workshop from the participants. He said that he now expects all the Workshop Coordinator to conduct the Main Workshop sincerely and diligently at their Remote Centre so that many more faculty may take advantage of this program. The workshop provided valuable knowledge on the nuances of Cyber Security to all the participants. The workshop a concrete platform to the academicians to discuss and solve the issues related to cyber security in present context.